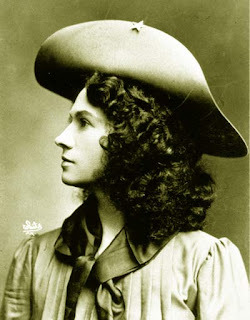 Annie Oakley, 1860-1926, was a great favorite of one of my sister's. Annie was a heroine, and the subject of a t.v. show back in the 1950s. She may have been one of the first woman superstars of American popular culture. How far does a personality reach into our lives...? "Will Annie Oakley's mother please come to the office and pick her up?" After hearing this announcement a couple of times, my mother turns around and notices one child is missing! Heading over to the office we find my sister there, waiting to be claimed.